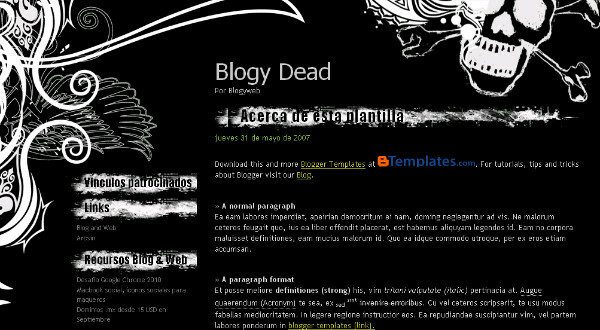 The grunge style Blogy Dead Blogger template has a dark two column theme that makes an instant impact.The large header area is designed like an album cover with the skull and bones and large design down the left side.The template designers page is not in English but with few changes needed to customize the template this shouldn't be a problem, If you do need help you can ask in the comments below. If you have any questions Post them below and we will do our best to help. Hi Paul, can you tell me is there a way to add that effect in the sidebar headers, where it looks like its wrapped around, to any blog. I have always loved this look.